The biggest names in tennis are competing for millions of dollars at the U.S. Open. But there's another fierce contest on the courts -- for the chance to be a ball person. The U.S. Open is the only Grand Slam tournament that pays its ball people, although they're only making $9 an hour, New York state's minimum wage. For most of them though, the job isn't about the money -- it's getting to be on the court with their heroes. "It's the best three weeks of my life by far," high schooler Madison Callinan said. "I get paid to wear Ralph Lauren and I have the best seat in the house, right on the court. It's fantastic." Callinan, a second-year ball person, said she treasures her time on the court. "Even though it's right before school, and I walk into school like an absolute zombie, I wouldn't want to be anywhere else." Eitan Darwish, also a veteran, said he still gets nervous. "I always have butterflies because it's really exciting to be able to work with the players no matter who it is," he said. "It's just an awesome experience." Leaf Fagerberg is a rookie this year. "I think this is the best job I've ever had," he said. More than 400 people tried out this year, waiting in line for hours for the chance to show off their skills for just a few minutes. Hopefuls have to be at least 14 and demonstrate that they can throw, catch and run. They also have to be agile and show they can pay attention and make quick decisions on the court. The goal is to get the ball off the court as quickly as possible. After a couple of call backs, the group came down to 240 ball boys and girls, two-thirds of whom are veterans. 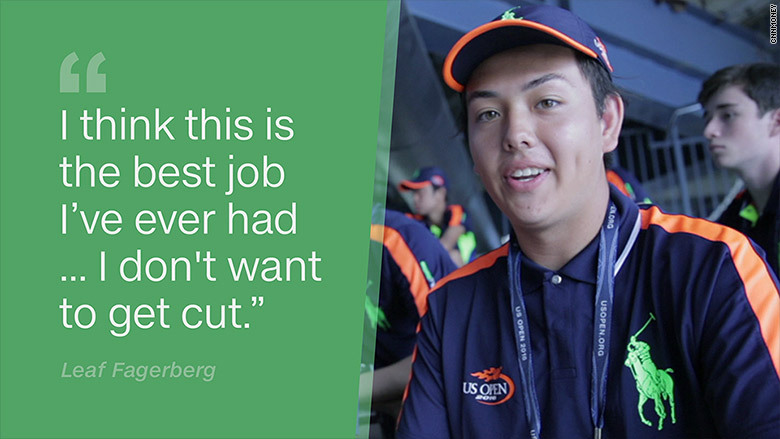 Anyone who's previously worked at the Open as a ball person doesn't have to try out -- but they can still get cut if their performance isn't up to snuff. 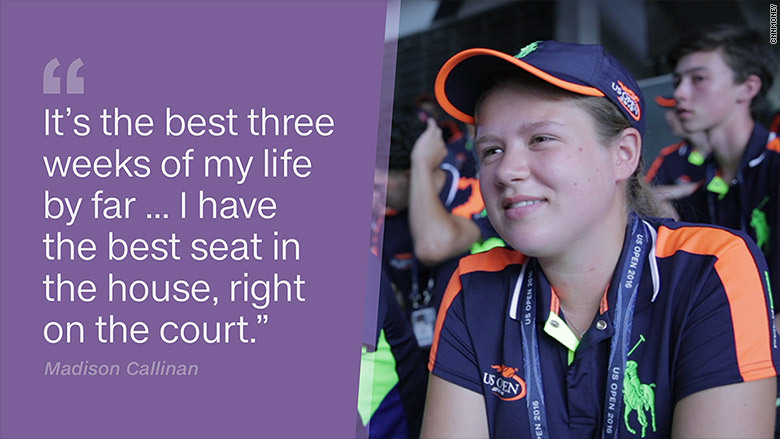 Despite how hard ball people work to get on the court, few fans will actually notice them. "If you don't notice them they're doing a great job," said Tina Taps, the director of the U.S. Open's ball person operations. "They work so efficiently, so quickly, so quietly." Taps added that they might draw more attention than usual this year, since they're dressed in neon. Their outfits, which are designed by Polo Ralph Lauren, are theirs to keep. Each ball person gets two sets of shorts, socks and shirts as well as a hat, sneakers, a jacket and pants. The women also get a pair of leggings. 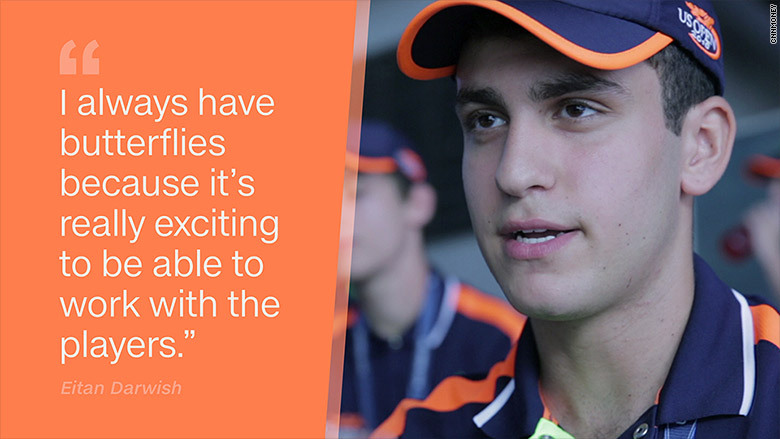 "This equipment is probably worth more than the paycheck I get," Darwish said. 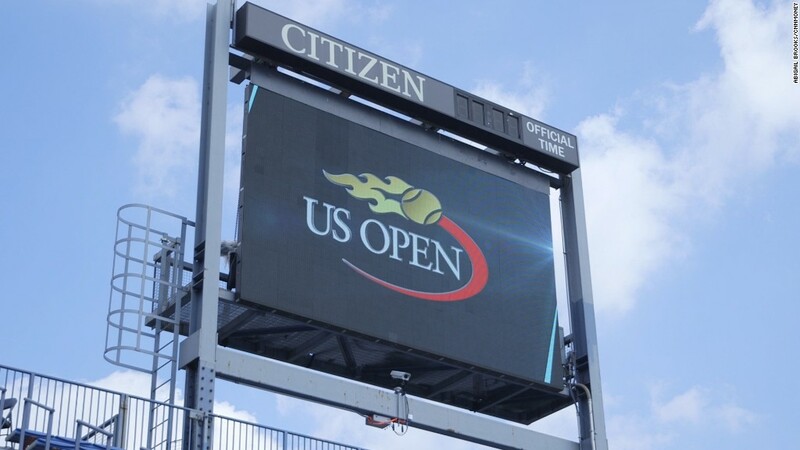 Just like the players, throughout the tournament the ball people are trying to work their way up from the outer courts, where the lower profile matches take place, to Louis Armstrong, the Grandstand and finally to marquee matches and the finals at Arthur Ashe Stadium. "That's the ultimate goal for any ball person," said Taps. "They want to be able to get on Ashe."